The opening salvo of the much ballyhooed Summer of Pie. There are recipes for creamsicle pies out there but the ones I found all seem to either involve ice cream or are of the personally loathed “semi-homemade” type and involve pre-made crusts and jello pudding (Friendly advice: if the “semi-homemade” approach really appeals to you, please do not attempt any recipes in this blog as you will certainly be driven insane). Therefore, I was on my own on this one. 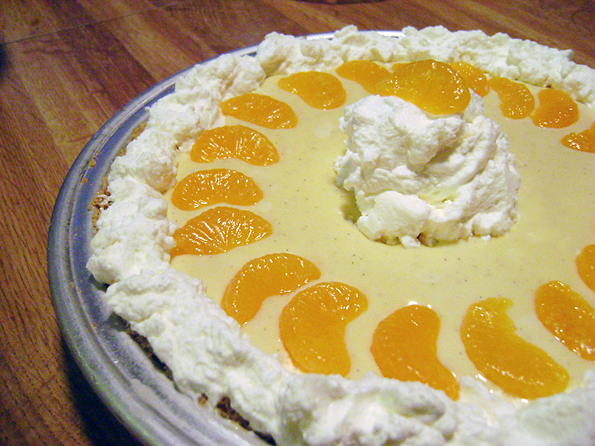 Recreating the flavors of an orange creamsicle seemed fairly straightforward: some type of crust, an orange layer, a vanilla cream/custard layer, and whipped cream (because, well, why not?). Then I went crazy, bought a 10″ pie pan, realized this single pie would require a dozen eggs, and gave up on the idea that baking pies instead of cakes was going to be any less complicated. Hold on to your arteries, it’s going to be a long summer. Note: This recipe is for a 10″ pie because I’m apparently incapable of making normally-sized desserts. Please let me know if you would like quantity conversions for the more standard 9″ pie. Adjust oven rack to lower-middle position and preheat oven to 375°. Melt butter and thoroughly combine with crushed graham crackers and sugar in a medium bowl. Press mixture firmly onto the bottom and sides of a greased 10″ pie pan. I’ve read, but not tried, that if you chill the crust for an hour before baking it’s less prone to cracking. Set aside while you prepare the custard filling. Pour milk and into a medium saucepan, then split vanilla bean and add the seeds and remaining pod. Heat over medium-low heat until steaming. While the milk is heating, whisk together eggs, sugar, cornstarch, vanilla, and salt in medium bowl. Heat pie crust in oven until hot, about 5 minutes. Remove vanilla bean pod from the milk, then, whisking continuously, pour steaming milk into egg mixture in slow, steady stream. Return egg and milk mixture to saucepan and cook over medium-low heat, stirring constantly, scraping bottom of pan, until custard begins to thicken and forms a ridge on tip of spatula when bottom of pan is scraped, 6 to 8 minutes. Leaving pie plate on oven rack, pour custard into hot pie shell. Bake until custard has set around edges but jiggles slightly in the center when shaken, 12 to 15 minutes. Cool to room temperature, about 2 hours. This step (along with the crust) can be done a day in advance. Just wrap tightly and store in the refrigerator overnight. Grate zest from the oranges, then squeeze the juice. Whisk together zest and juice, sugar, cornstarch, eggs and yolks in a medium saucepan and bring to a boil over medium heat, whisking constantly, 4-6 minutes. Tip: As you whisk the mixture and it begins to heat, a froth will form on top. When this froth completely dissipates the curd will be done. Remove from heat and whisk in butter and extract until smooth. Cool slightly (until no longer hot, but not so cool as it sets up), then pour on top of the cooked and cooled custard. Chill until set for at least 2 hours. Whisk together whipping cream, Grand Marnier and sugar. Beat until stiff peaks form (frosting consistency). Pipe or spread onto finished pie to decorate as desired. Mandarin orange slices also make for a fun presentation (my 9 year old niece had great time deciding exactly how best to use them). Slice and enjoy! Oh, sit down, you’ve probably been baking for a while and you should rest.